But Foster didn’t count on it being hard to find a school that felt like home when she started her search. UA was in the running, but with classical ballet being a priority in UA’s dance program, she didn’t think that was for her. Foster decided to give UA a chance, and auditioned for the Crimson Cabaret dance team before her freshman year. She made it to the final round before being cut. What could have put her on the path of looking for another college to call home had just the opposite effect. Foster enrolled at UA for the Fall 2014 semester, happy but unsure of where she fit at her new home away from home. Foster — a perpetually over-involved high school student — knew she needed to make some connections on campus, and signed up to take part in the Alabama Panhellenic Association’s fall formal sorority recruitment as a freshman. She fell in love with the Alpha Chi Omega chapter during recruitment, and received a bid to become a member. As she found her home in Alpha Chi, Foster began to find her academic niche as well. She began asking questions and picking the brains of her older Alpha Chi sisters, along with her resident advisor, about their studies. She realized that her declared major of telecommunication and film wasn’t quite the route she wanted to take. Foster made a switch in UA’s College of Communication & Information Sciences to study public relations with a focus on sports and entertainment. At the end of her freshman year, Foster applied to be a member of UA’s Student Recruitment Team, because older Alpha Chis told her, “Do everything” and pushed her to get more involved. UA’s SRT members serve as hosts to prospective students and student athletes through tours, lunches, info sessions, gameday activities and more. Earning a spot on the team gave Foster a better idea of how large-scale athletics operations work and continued to reaffirm that she had chosen a path for her studies that she would love as a career. When she rolled off the SRT after one year, it wasn’t because she had had her fill. Foster earned a job as a recruiting operations assistant within UA’s Athletics Department. While her gameday duties still looked much the same, during the week she switched her focus to Alabama Football’s recruiting operations. 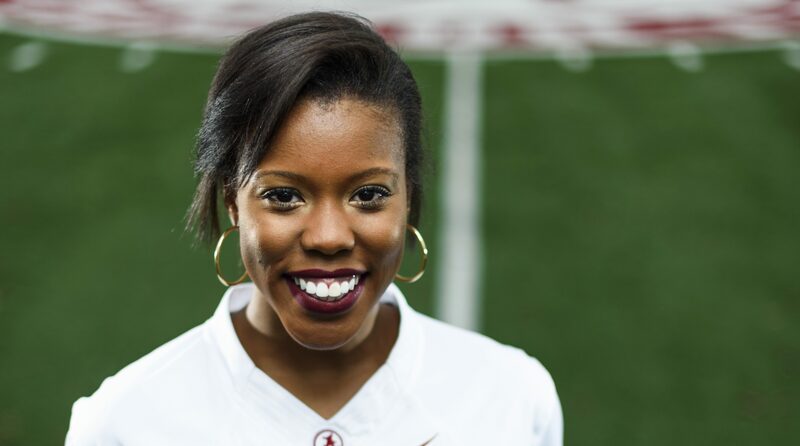 Foster said she dreams of a job working in event operations at Madison Square Garden, and her experiences with Alabama Football will help her get there. As Foster transitioned to her first year as a recruiting operations assistant, she expanded her on-campus involvement as a junior by serving as the SGA Homecoming director of choreography. She had previously served on the Homecoming rules and regulations committee, and knew she’d love to stay involved with it. Dr. Rosalind Moore-Miller, the Homecoming advisor and director of Student Involvement at UA, knew exactly where to put Foster when they discussed her interests. Foster, shown with her Alpha Chi Omega sisters, is currently serving as president of her chapter. As the Fall 2016 semester came to a close, Foster made history at The University of Alabama. On Oct. 5, 2016, she was elected president of Alpha Chi Omega. Among her sisters, there was no discussion of why Foster was unique. She had served the chapter well as vice president for public relations and marketing the previous year. Among those who knew Foster’s reputation and resume, there was no surprise. 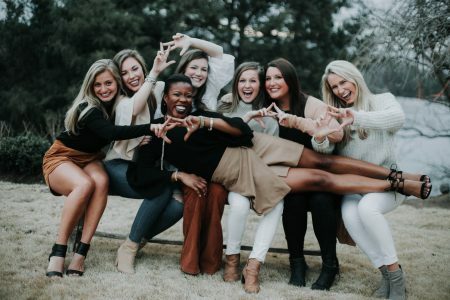 But for the first time, a National Panhellenic Conference sorority that participates in formal recruitment at The University of Alabama had selected an African-American woman to lead their chapter. Foster is the second-ever African-American woman selected to lead her APA chapter, following Hannah Patterson’s election as chapter president for Sigma Delta Tau in 2013. “I’m honored, because I know the responsibility it takes,” Foster said. “And for the first time, I know this is where I’m supposed to be. I feel completely comfortable in this leadership position. I didn’t expect to be the first to do anything. I was just trying to help out where I’m needed. While Foster said her election was something that just happened, those who have worked with her feel differently. For Foster, it is the behind the scenes work that keeps her going — even while her election has landed her in the spotlight as a leader. “Being the first and being able to represent an organization that has changed my life, I can only hope that I can make as big of an impact on someone else’s life as they made on my life,” Foster said. This story was originally published in the Winter 2017 issue of Capstone Magazine, the official magazine of UA’s Division of Student Life. Check out Capstone Magazine online.